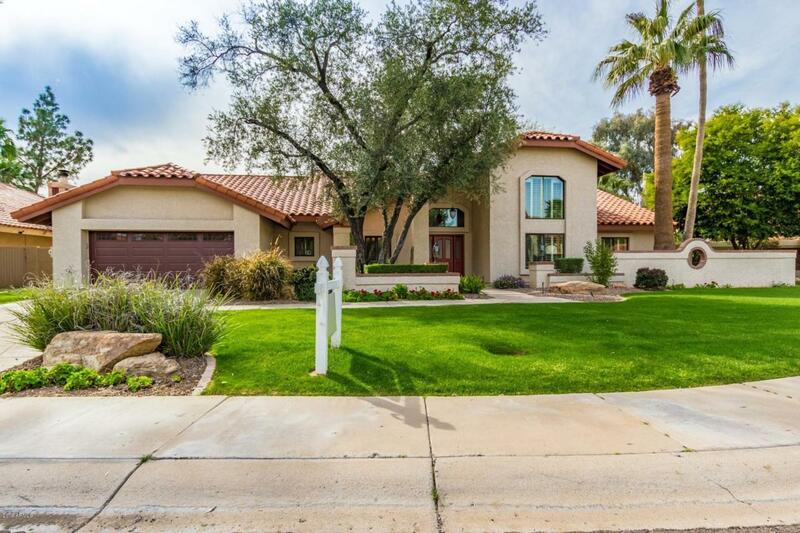 A rare opportunity in Scottsdale Ranch! Positioned in a cul-de-sac, on an inside lot, high ceilings 4 bed or 3 bed/den split master, one story family home. Spacious inter-leading reception areas w/ floor to ceiling fireplace & wet-bar, allows this home to be fabulous for entertaining. The master suite includes sitting area & exquisitely redone master bath, w/double vanities & huge 'no-step' shower overlooking tree-lined backyard. The eat-in kitchen w/custom cabinetry & high-end appliances opens to impressive entertainer's patio, resort like backyard w/pool & spa, . Special features include: new roof, dual pane Pella Windows thru-out, whole house industrial H2O filtration, 3yr young HVACs, newer paint, carpets, spa heater and new pool heater.